Born in Boliden – a small mining village in the far north of Sweden – Petter Sundkvist started in early years as a trumpeter in his father’s Wind Band. After studies in cello and piano he went on with conducting studies with Jorma Panula, Kjell Ingebretsen and Eric Ericsson at the Stockholm Royal College of Music. In 1993 he studied contemporary music with Peter Eötvös in his renowned Institute. In the 90s Sundkvist rapidly achieved a leading position on the Swedish musical scene and is today among the most sought after of Swedish conductors. He currently serves as Principal Conductor and Artistic Director of Norrbotten Chamber Orchestra, the contemporary music ensemble Norrbotten NEO and Piteå Chamber Opera, ensembles with which he has toured USA, Portugal and the Nordic Countries. He was Principal Conductor of the chamber orchestra Musica Vitae until 2006, an orchestra with which he has toured Spain and the United States. He held position as First Guest Conductor with the Gavle Symphony Orchestra 2002-2007, and up until 2004 he had a similar position with the Swedish Chamber Orchestra, where he collaborated on numerous CD-recordings. Petter Sundkvist has created for himself a broad and eclectic range of repertoire and styles stretching from the great classics to the composers of the 21st century. He has conducted more than 100 debut performances of contemporary music and nearly 30 opera productions in a variety of venues including all the major Opera houses in Sweden. A regular guest with all the major Swedish orchestras, he has also appeared with major symphony orchestras throughout Scandinavia, Germany, Russia, Iceland, Italy, Slovakia, the Netherlands and Great Britain. With a background in his internationally acclaimed recordings of Kraus, Petter Sundkvist has gained a reputation as an expert in the performance of eighteenth and early nineteenth century music. Among the artists Petter Sundkvist has collaborated throughout the years are Janine Jensen, Dmitri Sitkovetsky, Peter Mattei, Anna Larsson, Truls Mørk, Nina Stemme, Ronald Bräutigam, Andreas Blau, Gordon Hunt, Martin Fröst, Karen Gomyo, Ole Edvard Antonsen, Christian Lindberg and Dame Evelyn Glennie. The last years, Sundkvist main focus have been on contemporary music, especially in his work with Norrbotten NEO – an extended Pierrot Lunaire ensemble which he founded in 2007 with funding from the national, regional and municipal governments. His strong commitment to contemporary music has given opportunities to close collaborations and premiered works by many important composers. Among them are Chaya Czernowin, Magnus Lindberg, Anders Eliasson, Bent Sørensen, Ingvar Lidholm, Per Nørgård, David Felder and Jan Sandström. 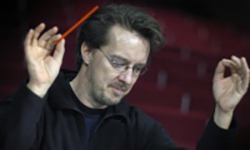 During the season of 2012/13 Petter Sundkvist will leave the position as Artistic Director of the ensembles situated in Piteå and return to guest conducting.